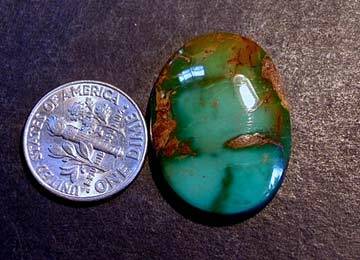 Royston turquoise is from a group of mines near Tonopah, Nevada. The Royston District is one of Nevada’s better known turquoise-producing areas with the Royal Blue, the Bunker Hill, and the Oscar Wehrend being the three most important mines. Royston turquoise can be unbelievably beautiful. Colors vary from different shades of green, dark sky blue to green and blue together in one stone. Matrix can be a beautiful brown and the best Royston is equal to that found in any American mine.